Eccentric musical pioneers, Blancmange melded a unique sound, bringing together electronic and eastern influences with a distinct dance floor sensibility. The resulting album, ‘Happy Families’, with its mixture of theatricality and sincerity won them a legion of fans. From their origins making experimental synth wave, to the chart-topping yet cool and credible hits, Blancmange were at the very heart of 1980s club culture, from support slots with Grace Jones, to killer 12” remixes by the likes of John Luongo. Their tracks were on regular rotation in sweaty nightclubs from New York, to Berlin to London, forming part of sets reflecting the open minded “as long as it moves the floor” policy of the time, that would see their records blended seamlessly with disco, post punk, EBM, new beat and early house. Their music also sat with equal comfort alongside both the synth pop of piers OMD or Human League and leftfield cult figures like Cabaret Voltaire or XTC and was undoubtedly popular with many of the leading electronic music pioneers worldwide. Predating the acid house explosion and the many subsequent sub genres, Blancmange’s music is a key cornerstone in the musical landscape that shaped both the original electronic music boom and its huge lasting legacy. ‘Happy Families Too’ features the exclusive ‘Running Thin,’ with several brand new remixes by Vince Clarke, Greg Wilson & Derek Kaye and London based electronic band Komputer. These five special tracks emphasis Arthur’s desire to continually move Blancmange’s music forward in new and interesting directions. Their influence on the past few years’ slew of electro revivalists like La Roux, Hot Chip and Metronomy has been well documented, but of equal note is the likelihood that anyone partying from Dalston, Peckham, Brixton and beyond in recent times is likely to have heard Blancmange tracks fitting perfectly into sets by hip party selectors proffering cold wave, Balearic, electronic oddities, cosmic disco, house and even techno. For the first time ever, the November 2013 tour saw Blancmange take the album to the stage in its entirety. And, never one to stand still, Neil Arthur has given the songs that won such popular acclaim three decades ago a thoroughly 21st century spin, with a fresh look at an album that influenced so many. Due to continuing health issues, Stephen Luscombe was unable to join Neil on the tour. However, Neil was joined for the entire list of dates by guitarist David Rhodes, who performed on the original album, and sound engineer Adam Fuest, a long-time collaborator who will be manipulating the live sound and visuals. With a brand new album slated for released later in 2014 the time is ripe for yet more Blancmange action. • This CD is released 7th April and will not be shipped prior to this date. 3. I’VE SEEN THE WORD. 5. LIVING ON THE CEILING. The 12″ EP that we released recently for Record Store Day has now been made available digitally. 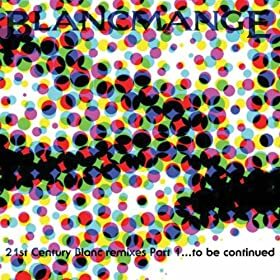 The EP features remixes of Radio Therapy and The Western and also includes a remix of the Blancmange classic Living On The Ceiling. It is available to buy now from iTunes, AmazonMP3, Play.com and all good download stores. You can also listen now on Spotify. We’ve put together a playlist of ten tracks that impacted our lives and which inspired us to first pick up electronic instruments. Have a listen now on Spotify or we7. Not got a Spotify account? Visit spotify.com to sign up for a free one. Visit we7.com to signup for a free account and stream music within your browser. How’s your bum for cracking walnuts? Find out more tonight. Blancmange live in session with Janice Long. Find out more on the BBC Radio 2 site. It is with regret that Blancmange founding member Stephen Luscombe has been advised by doctors that he cannot join the band’s forthcoming national tour which commences this Sunday March 6th. Stephen has been diagnosed with an abdominal aortic aneurism, with complications, that have affected his mobility & requires investigative surgery. Blancmange regret Stephen’s absence but look forward to the forthcoming shows with Neil Arthur, Pandit Dinesh & Graham Henderson. Everyone would like to wish Stephen well during this time and for a full recovery. Stephen is sorry not being able to come out on the road, he would like to assure everyone that Neil has been working hard to get everything up to scratch & wishes those who see the show have a great time.